Today is like the first day of spring in Georgia...mid 60s and sunny. And it's going to stay this way for several days. Yeah!! I'm in Tennessee, and it's 41F and sunny! Indiana here. We got 14" of snow on Wednesday and it's supposed to be 52 degrees by Sunday....the snow will be all gone! Today is bright with the sunshine reflecting off of the snow....just gorgeous! We are in the middle of that moving snow storm (NY)- they said we would get an inch, but boy were they wrong! But tomorrow is to be near 50 so it should melt off quickly. Here in SW WA, it's bright and sunny and chilly. Looks great from inside, but really gets your attention when you step outside! I've made whole quilts with Rock Candy fabric - I really like it. It's a bit thicker than standard quilting cotton, so my hand-applique friends aren't great fans :-) The colors go with everything! I also like that I can use a white (Alabaster) background and have no worries that other colors will show through. to stay in my apartment cutting some fabric. I live in N.E. Georgia. It is sunny and very warm today with temps in the 60's. A very nice change after the cold,rainy and windy days we have had. Thank you so much for the giveaway. I'm in Kentucky and today the sun is shining and it's up into the 40's. This weekend we're supposed to have 60's. Come on spring! I am now following Blank quilting Fabrics on FB. and I love the Florabelle fabrics. Oh and I'm in the north of Germany and even with several layers of clothing on and the heating on, I feel all over cold today. Here is southcentral Kansas, it's cloudy and we are hoping for lots of rain but will be happy with any amount. I'm in wyoming and it's a balmy 30 with snow on the ground. Skies are cloudy. Hi Debbie!!! Today is a sunny but a bit cool day here in New Brunswick, Canada. I am bouncing around between this blog hop and my sewing room...lol. Hi Debby, after the freak snow storm on Wednesday and a day off...today feels and looks a beautiful early spring day. I really like this block and can envision it made up in African fabrics. Thank you this opportunity. Cloudy in my part of Texas. Thanks for the giveaway! I am from Iowa and we have the sun finally shinning after a snowy week. Thanks for the giveaway. It is a beautiful day here today. Spring is on the way. I live near the beautiful Hopewell Cape Rocks. Thanks for having a give away and showing us how to make your quilt. I will be saving it in my favorites. there's a light rain here in beautiful downtown seward, alaska and slightly warm [just above freezing] about par for the season. have been to blank quilting's fb page and joined their following. thanx for the pattern and the chance to win your pretty fabric. What a beautiful quilt! Thanks for the free pattern and great tutorial. It's 52 right now in northern California, near Sacramento. Ahh beautiful fabric! I'm now following Blank Quilting on FB. The weather here in western Oregon is gorgeous today: clear blue skies with little white puffies here and there, right now about 44 degrees. Frost this morning but should reach mid-50s. And I love blank quilting's new cover photo with the butterflies and dahlia print. Thanks for another terrific giveaway. Sunny here today in Western Washington... the puddles are beginning to disappear (at least for today)! Your quilt looks wonderful in its new home! Southern California is rainy and cold. Snow in the mountains too. Winter isn't finished yet but that's okay because we need the rain! Thank you for the fun pattern! And the chance to win that yummy fabric! I'm in Virginia and it was 50 and sunny here today. It's a little overcast here in western Missouri but the temp hit 55 so I'm very happy! I am in WA and it is sunny today - plenty of blue sky - and about 50 degrees. Hi Debbie. I'm in Wisconsin and it is cold and icy. But looking at beautiful quilts cheers me up! Thanks for the great tutorial. You take wonderful photos. And thanks for the lovely giveaway opportunity. Here in Oregon, we have had a rare sun shinny day! Awesome blue sky with a few puffy clouds! Gorgeous! The Saskatchewan prairies proved cloudy, sunny and we had a skiff of snow! That is a beautiful quilt and thank you for the tutorial. Thanks for the tutorial, I love that pattern! And, much easier than it looks! :) I'm in Madison, Wisconsin and believe it or not today was actually sunny and I think we saw some snow melt. Tomorrow = rain! Thanks for the chance to win. I live in Surprise, AZ, a suburb of Phoenix, AZ. Our region of Arizona is nicknamed the Valley of the Sun, but today would not have lived up to to that name! It has been very cloudy most of the day, plus it rained most of the day and even hailed in some parts of town. By AZ standards, it has been an interesting winter and we even had some grapple a few weeks ago, which is kind of a slushy snow and made driving for us desert rats a little unnerving! The weather was gorgeous here in Oregon! Cool in the shade but warm and toasty in the sun. I am in CA and it was a beautiful sunny day! Ohio and today was sunny and 45. Beautiful sunny day near Seattle, WA...almost makes me want to leave the sewing room for the garden. Sunny but cool in Northern CA. Great giveaway. What a great quilt, thanks for sharing this pattern !! This week we had such lovely spring weather but today its raining and I hear that the winter is coming back... they even said we get snow coming week !! I live in the Netherlands. In Scotland it's cold and very windy. 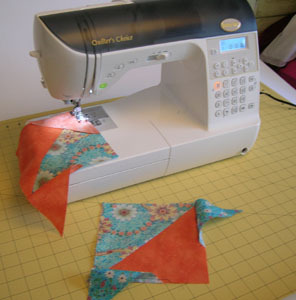 I am following Blank Quilting on FB. Hi Debbie, I live in Hastings, that's on the east coast of New Zealand's north island. We are in late summer and it was a sunny 23 dg C today. Love your block tutorial, many thanks. It is raining again, here in the south of The Netherlands. We had a few lovely days that felt like spring had finally arrived, but the forcast is for more SNOW on Tuesday... YIKES!!! Hi, I live in Northern Michigan and it is cold and still dark out. Yesterday it was about 39 degrees and sunny. I hope it is the same today so more of my snow will melt. I live in Wisconsin, and it is getting ready to rain, that will make the snow melt faster. Today is a beautiful sunny day,where everything outside is blanketed in clean white snow that fell Thursday and Friday. Today temperature is expected to reach in the high 40's. I livein Massachusetts northwest of Boston. Thank you for the free pattern and giveaway! Wow....what an awesome technique. Thank you. Today is supposed to be beautiful...waiting for the sun to come up. 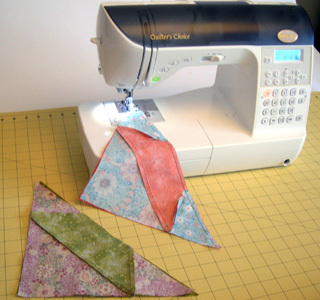 Hi there all quilters worldwide. I live in Southern AZ. Our temperatures vary from 40degree F to 80degrees F during this time of year. We have clouds, wind and rain today. I can't wait for next month and warmer temps begin.... yea! The weather here in Perth, Australia is hot, hot, hot! Lovely colours in your Gretchen quilt. We just had a temp drop here in middle Sweden, -20 C! But it is glorious and sunny outside, and a bunch of birds have come out of the forest, even the shy Dom Herre, that look like they wear a black coat and red ascot, and have such a plaintive whistle!Love the pattern and your bright and wonderful version of it! I went to Facebook and followed Blank Quilting too . We are having another cold snap and lots of heavy rain which is highly unusual for Phoenix. It was in the 40's yesterday. Should be close to 90 by Friday. 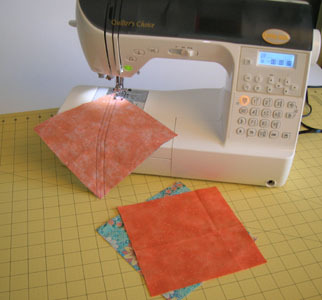 I am following Blank Quilting on Facebook. Cool idea to avoid having to cut oddly shaped pieces! I have liked their facebook page. I am located in South Carolina, USA . Our weather is clear and cold this morning. Hi Debbie, In Texas with overcast skies praying for rain ! I went to Blank Quilting on FB and I DO like them ! Thanks for having a giveaway ! Yep, spring in the North Georgia mountains. My poor daffodils have been snowed on three times since they popped up, but I think today may get up to the 50s. Hi Debbie , today in Nova Scotia it is overcast and has a look of spring , most of our snow is gone but I am sure Mother Nature has more in store for us. Thanks for the pattern for this gorgeous quilt and for the chance at your giveaway. I'm in England and the weather is grey and gloomy! I'm in south east Texas and the weather is supposed to be 79 today. It's currently 67 and drizzly. I love your quilts. I live in Saskatchewan and this morning it is -17C - a bit chilly for mid-march... We have LOTS of snow left and more on its way. sigh..... Thanks for the opportunity on the draw. Today in Quebec Canada it is bright and sunny.Still lots of snow on the ground but it suppose to go up to +5C. so maybe some of the snow will melt. I am in N. Georgia and the sun is shining.. and the fishermen are out on the water fishing. A perfect day for me to keep on cutting out blocks for a quilt I want to make at my retreat next month and think about what I am going to find at Quiltfest this coming week at Pigeon Forge, TN. I have now added Blank's to my FB page. Today,in Murcia is a sunny and windy day. Cloudy and perfect 70, in Arlington, TEXAS.. I live near Manchester in England. Today is overcast and cold. Thanks for the tutorial! I'm in Southern Nevada and its been raining off and on. I live in Oklahoma and we are getting much needed rain today! Sunny Azizona, after a long day and night with lots and lots of rain! Love Rock candy!! Off to grab your instructions on Gretchen! I live in Munich, Germany, the weather is a bit dreary today, but we had beautiful spring weather the last three days. I headed over to Blank Quilting on FB and subscribed them on my account (same e-mail as here). Thanks for the chance! Thanks for the tutorial and pattern! I'm from the suburbs of Chicago and the weather isn't so great. Snow on the ground, no sun shining and some freezing rain. Thanks for a chance at those pretty blenders! I live in North Carolina & we're having a warm (60 degrees) & sunny day today. I liked the Dahlia collection on Facebook. I live in Winfield,Kansas and we are getting RAIN! Hasn't rained much here for 2 years, so every drop is loved. Thanks for the chance to win. I live in Georgia where it is sunny and 55 degrees with a forecast for 70 degrees - what could be better? 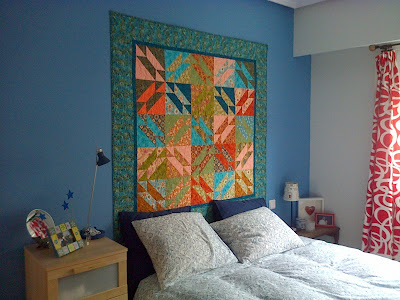 I have always loved that pattern and your quilt is gorgeous in those colors. Thanks for the tutorial. Weather here today - sunny and in the 70s (So CA). Well, thank goodness I'm not in the North Pole! I live a little south of there, in Minnesota. It's still cold and we got a lot of snow this week, so it looks like a winter wonderland. It's beautiful, but I'm ready for Spring and those yummy fabrics would really help pull me through--lol!! Alberta, in Canada. temp is -13C and sunny. those fabrics are pretty sunny too. What a beautiful block you shared with us... Here it's snowing snowing, snowing. Just what Michelle was sick of. At least it's not the blizzard they were predicting. No wind, just lots of snow. Don't you know the past 2 days it was 60 and beautiful! :-) Gotta love Colorado. If the weather bugs you, just wait in 2 hours something will change! It's sunny and will be in the low 50s here on Long Island, after yesterday's 4 or so inches of snow. I'll be meeting some quilters for lunch, and spending the rest of the afternoon quilting with another friend! I can't wait. These blenders are great, and I love the Gretchen quilt. Great idea! It's cool & oh so windy here in Jay, OK!! Supposed tohave rain blow in later. I think I will stay in & quilt! Today it is sunny--but yesterday we had a snowstorm. I am in CT. It sunny andin the high 60's today in Arizona. Yesterday it poured down raining which we are not used to...Thanks for the give away!!! Its a beautiful sunny, cool spring day here in Placerville, California! Well you did make that easy, I've just the fat quarter bundle for this! It may have to wait a few days because the weather here is 50! Yeah! I see spring is near! Thanks for the tute and the fun give-a-way! In Calgary, Alberta it is 3C and sunny. We will be on the plus side all week so more snow will be melting. Yay! I'm following Blank Quilting on FB now and liked Dahlia. Thanks for the great pattern and the giveaway. It is very sunny here in Tel Aviv :) Thanks so much for the great giveaway! The weather is beautiful here in sunny southern California. Would love to make this quilt. I live in western Michigan with some cloudy, cold weather. But it is getting warmer and one tulip is poking out in the garden. After some freezing nights, it's a beautiful sunny day in the Florida, with temperatures about 70. Just perfect! Thank you for sharing those pretty blender fabrics. The weather here in southeast North Carolina is gorgeous......bright, sunny and 62! Looks like it will stay this way for a few days too. Thank you for the tutorial and for sharing the pretty blenders. Nearly 60 degrees and the sun is out today. Yea!! Nice block. Thanks for the chance to Win! Hazy and misting here in North Tx. Sunny in the morning and raining in the evening today in Malaysia. I'm enjoying my retirement here in Mexico (lived in Seattle) and it's in the 80's (lows are 40's). Thank you for the chance to win. I'm in Utah and we have some of our lovely almost spring snow on the ground melting away. 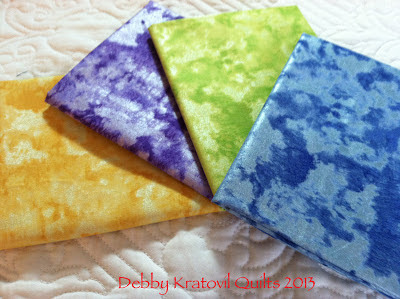 I really like the California Dreamin' fabric at Blank Quilting. I liked it & shared it on my facebook timeline. 60 degrees and sunny in lower DE. And here I spent the day working on a clipper ship in a Baltimore Album class. Some life, huh? What a great day on which to ask. We're in the Pacific Northwest and it is absolutely gorgeous. This is likely the first day I could have said that. Hooray. Thanks for including me in the giveaway, even though I'm not on Facebook. I do like their fabrics, but only in the real life sense of the word. I'm in MI and it's been sunny and partly cloudy (sunny?) all day. The temp is around 40F, so I think it's a pretty nice day. I liked the fabric on Blanks FB page as karrie smith. Thanks for the chance to win! I'm in central CA, and it's sunny today, in the 60's F, very nice weather. Thanks for the chance to win! loving that block! Thanks for the tutorial :) It is warming up here in Ottawa. I live in Illinois and it was beautiful today. A little chilly but to me that's perfect. Not to cold but not hot. I like Blank Quilting on fb. Here in Michigan snow is melting and spring is just around the corner. I am in WV and it has been a sunny beautiful day and 57. Love the bright sun. Thanks for the tutorial, it will be bookmarked. Thanks for the give a way. I live in sunny Brisbane, Australia, except, we haven't seen the sun for about 2 weeks. It has been raining on and off and expected to do so for another week. Yes, it is raining again right now as I write this comment. Thanks for the lovely giveaway. whoever wins will be very lucky indeed. I love that quilt, thank you for the download of the pattern. Our weather is very windy, but the temperature was in the 60 degrees, but forcast of snow yet tonight or tomorrow with a high of 35 degrees. BURRRRR. This is central Kansas, USA. I went to Facebook and 'liked' Blank Quilting'. We finally had a warm day! Sunny most of it, too. I have a daffodil happily blooming out front, too. I think it was close to 60. I'm in Georgia and it was in sunny and warm in the 70's. thanks for the giveaway. I went to Blank Quilting's Facebook page and liked their Yummy Rock Candy fabrics. In my part of Illinois, today was cloudy with a touch of rain here and there. Supposed to rain all night and again tomorrow. At least the snow is melting. I am in central VA and it was a warm and sunny day - finally! Here in Pa it was a beautiful sunny day! Spring is a-coming! I am at my lake cabin in NW Wisconsin today (I live in Minnesota) and our weather had snow, sleet and rain; something for everyone. Thanks for the chance. Debbie, I am in central florida where the day started with a chill and the evening is ending with a light spring breeze. Thank you for the chance. I absolutely LOVE those fabrics! They are beautiful. It was a beautiful 60 degrees in Pennsylvania today! Hi Debby, in Illinois today with all the snow on the ground it is 38 and sunny. Woohoo!! I live in Oregon, and the weather was warm and sunny today - in the 60s. Love your quilt, and what a great tutorial - thanks! Downloaded the pattern :) Love the Rock Candy fabric! Beautiful quilt Debby and thank you for the great tutorial and pattern. It rained a lot today here in Northern IL. We were supposed to get over an inch of rain with temps about 40 degrees and above. Other than the rain, not a bad day. It sure beats a few days ago when we got 9.6 inches of snow with high winds causing visibilty problems and blowing/drifting snow. Well I do live at the North Pole. Just kidding but I do live in the great white north, in the Yukon Territory in Canada. Thanks for a lovely giveaway. Estoy en Barcelona y a pesar de ser invierno tenemos unas temperaturas de primavera. I live in the UK and the first time for three days it is not actually raining. But it is grey - again! I am in NC and finally it feels like spring. I hope it lasts this time. No more cold air please. Right now the wind is blowing and it is raining here in Texas. The temperature is 51 deg. SLC Utah is sunny and cold right now. Its a grey and just above zero here in Nova Scotia, Canada. Spring isnt far off though. Thanks for sharing your block making process. The quilt is wonderful. It's partly sunny and breezy this morning. Im in NC and today the weather is AWESOME! temp in the shade shows 70s, but its not quite right and its a bit windy too. It's sunny in Nebraska, but cold and windy, too! It is grey, cloudy, and rainy here in Hale, Missouri. I live in the sunshine state of Florida, and the weather is beautiful. Think we will be in the 80's today. Thanks for the great giveaway! The weather in Sonora, CA is sunny and the temp is in the 60's. I am enjoying your Welcome Home BOM and have printed out the Gretchen quilt pattern. Those bundles of blenders sure would make a pretty Gretchen quilt. Thank you for a fun blog and giving all of us a chance to win. The weather is rainy here in southwest Missouri but we sure need it. Thanks for the chance to win your generous giveaway. Here in East Yorkshire, UK, in the last week we have had 3 days of fog.....2 of heavy rain, 1 of bright sunshine though little warmth...and now its snowing!! Today in Western TN it is rainy and windy and only in the low 60's. Yesterday was beautiful, sunny and hit 72 degrees. Sure made up anxious for spring. The quilt you made is beautiful. I can see why they picked that one. Thank you for the tutorial on the blocks. Thx for the nice tut! Here in AZ we are LOVING winter- because we know what follows, a very short spring, don't blink, & then an abysmally hot summer! Today in Texas it is in the 60's and sunny. Yesterday near 80 and cloudy. We did get 1 1/2 inche sof rain overnight:) yea!!!! Currently here in Barryton, Michigan it's 43*F and the little village is party cloudy with off & on rain. Thanks for sharing your great tut with us and the chance to win those super yummy fabrics. I live in Hatfield Pennsylvania. Today it's sunny and 59 degrees which is pretty good for winter in the North East. I live in St. Paul, MN and today it's grey and about 20F. Not too bad, but I can't wait for Spring! High of 68 and sunny here in the southwest desert -we just had a rainy cold spell - but we will be back up to 86 by Wednesday :( - just came in from doing yardwork... What a great tutorial - I just went and got the pattern! I feel like I already won! I am a new follower to your blog. I have a feeling I will learn alot from you! I am in Charlotte, NC. It was about 65 degrees today and sunshine. I finished a quilt top today and had to take it outside to take a picture. I should have been outside playing but I played inside finishing up a baseball t-shirt quilt for my grandson. I am in Oshawa, Ont. Canada and the weather was in the 4 - 6 range, the snow was melting today! Thanks for the free pattern and the tutorial, Debby. Those blenders really ARE awesome. I live in Jerusalem, Israel. It's getting warmer and warmer here, with a heat wave expected by the weekend! It was a beautiful day here in NW Florida today. We worked in our garden, getting ready to plant our spring veggies, herbs and flowers. Thank You for the free pattern/tutorial. Thanks for chance to win. I live in Salt Lake City, UT and is is acting like spring is here at least for today. I liked you on facebook. Rainy and yucky in Indiana today! It is over 38C here so really hot and humid which is unusual in South Australia.